I have had this strange question since long. First time I had this question was when I saw a woman with a shaved armpit and shaved arms and legs. To me it felt like looking at a piece of chicken :-). Back then I wondered why did she do that? I had no idea about beauty parlours and the things they do there. 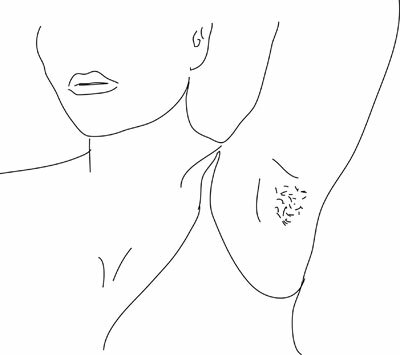 Is the armpit hair and body hair useless? Then why did God give it in the first place? Then my menstrual cycle started and I discovered having a lump in my armpit before start of periods every once in a while. I wondered what that was? As I grew up and decades passed one day I googled for it and learnt that it could be symptom of breast cancer. Oh my god, I thought. Then I wondered why does the lump come and go just before periods and that too not every period? One day my husband said his mom used to check his groin when he was little to see if he really was ill (When he wanted to bunk the school and told her that he was ill), by checking if there are any lumps in the groin! Last month I attended a yoga course and the ayurvedic doctor and the yoga teacher told that the lymph glands at the armpit are like sensors for the immune system. They swell in the armpit when a disease is about to manifest, when a virus has entered but has not yet shown its real nature. This informs the immune system to act! Hmmm…interesting. Then I thought may be armpit hair has a role in this too! And what about people who apply deodorant in the arm pits? Does it block the lymph gland sensors in any way? A friend shared this link telling about the importance of a wooden comb. He said his dandruff has reduced since he started a wooden comb! In a book related to yoga it is mentioned that if you have right nostril blocked, place your right palm into the left armpit with thumb resting on armpit chest and that the ancient danda was used by sages for this purpose. From my experience this is easier to do lying down. If your right nostril is blocked, lie on your left side and place your right hand into your left armpit and sleep or relax. Place it such a way that the armpit is pressed a bit. Things are still not clear to me about armpit hair, except intuitively I feel we should not tamper with what was given to us since the body is such a complicated mechanism and our knowledge of it so bare! If you find any more information by experience or second hand, please share here. I have never shaved my body hair so I do not know a comparison of how it feels with and without hair and how the body functions differently with and without hair. If you are one of those who have this experience and had the sensitivity to notice the difference please share! Shavasana – How is it different from sleep and why is it important.